As with every article I write, I’ve done my best to make this accessible to both those who do and do not regularly enjoy comic books. If you have any further questions please don’t hesitate to drop me a line in the comments far below. As mentioned up above it’s become a recent trend for Marvel to replace longstanding characters with new or different characters. Similar to what will be taking place with two Captain Americas, a number of these examples also feature both New© and Classic© varieties existing and bearing the moniker within the same world. I want to break down two recent examples, paying particular attention to how they’ve been written. Most of the world knows Hawkeye as Clint Barton, played by Jeremy Renner in the excessively popular Avengers movies. Unbeknownst to most non-comic readers another character owns the mantle, a young woman named Katherine “Kate” Bishop. Kate has been Hawkeye in not one, but two volumes of Young Avengers, which combined number over two dozen issues. Much more importantly, however, she was co-lead in the Hawkeye book written by Matt Fraction [a title I’ve spotlit in the distant past]. Hawkeye #2 (Vol. 4). Written by Matt Fraction, illustrated by David Aja. In many ways she was presented as a direct contrast to Clint’s tire fire of a life, proving to be competent and aware when he often wasn’t. Perhaps even more notably, however, later issues split up the duo, and the installments she led solo revealed that Kate tended to make just as many mistakes as he did. While she began her career in superheroics as part of a group of teenagers living in the shadows of giants she’s come a long way to standing on very equal footing with her namesake. Kate currently continues to star alongside OG Hawkeye in All-New Hawkeye. The eighth blog post I ever wrote for this site was about Miles Morales, aka Spider-Man. To boil a sizable chunk of comic book history down, he existed in an alternate universe where Peter Parker died, and role was open and waiting to be filled. Recent shenanigans in Marvel’s largest [and arguably most successful] line-wide event resulted in him being transplanted into the primary universe. Secret Wars #9 (Vol. 2). Written by Jonathan Hickman, illustrated by Esad Ribic. What’s particularly important to mention is how much time was devoted to Miles getting the hang of things [pun 100% intended]. After his universe’s Peter Parker passed away Ultimate Spider-Man came to an end after 160 issues it was relaunched as Ultimate Comics: Spider-Man [28 issues] with this new character as lead. This was followed by Miles Morales: Ultimate Spider-Man [12 issues]. It should also be mentioned that he was a part of the ensemble book All-New Ultimates [12 issues] as well as appearing in other titles from time to time. The real icing on the cake is that next month marks the debut of him starring in Spider-Man, a title unadorned by adjectives or qualifiers. It’s worth noting that he will be doing the vast majority of his superhero work in New York City, while Peter Parkers [over in The Amazing Spider-Man] is doing a lot more jetsetting while fighting crime on an international scale. Both Hawkeye and Spider-Man, Kate Bishop and Miles Morales, have been given ample time to try out their respective masks and tools of the trade and get comfortable. It’s in that same way that readers have been able to become comfortable with them bearing the name, and indeed many comic book readers have no problem with them occupying the same general space as their predecessors. What’s most important is whether they’ve been given the chance to be known as characters and as people in these roles, and arguably both have. A larger number of issues is certainly a contributing factor, as more time inevitably leads to more stories, but all it takes is one well-written run [see: Fraction’s Hawkeye] to cement that personality and fresh direction. While it’s fortunate that Miles and Kate both succeed in this regard, they only serve as examples of what Sam Wilson has been unable to do. Given my love for the character I’ve read almost every appearance of Sam Wilson as Captain America, and it wasn’t until the announced return of Steve Rogers that I realized just how poorly Sam has been treated while donning the red, white, and blue. What follows are the character’s appearances up to to this point in time, and what’s notable about them. All-New Captain America : Written by Rick Remender, who penned the preceding Steve Rogers-led Captain America that led to this new status quo, this title only ran a total of six issues before it ended to make way for the upcoming Secret Wars [that’s a long, complicated story]. Remender took great care in beginning every issue with a flashback that helped build up who Sam is, whether as the son of a pastor or merely a person who dreams of fatherhood. While Stuart Immonen’s inks were a definitive high point for many, as far as the narrative is concerned the focus was largely centred on this new Captain America having to live up to the immensity of the legacy he became a part of. Captain America and the Mighty Avengers : Lasting slightly longer than the other two books it ran alongside, writer Al Ewing’s goal was very different. A continuation of his Mighty Avengers, this book had always been more “The Luke Cage Show”, with an explicit emphasis on classism. While quite good overall, one of the most notable observations made about Sam Wilson was that, due to a line-wide event that inverted morality, he spent his second and third issues evil. Only having run a total of eight issues that means he spent 1/4 of this title being more dastardly than your average villain, advocating everything from totalitarianism to anti-mutant bigotry. Uncanny Avengers #4 (Vol. 2). Written by Rick Remender, illustrated by Daniel Acuña. Uncanny Avengers : The second volume of a book starring the Avengers Unity Division, formed as a means to help improve human-mutant relations, this run only lasted a paltry five issues. Given that your average single issue is about 20 pages of story, that tops out at around 100 pages. Having just picked up my trade paperback to make sure, Sam Wilson appears for a grand total of 13 pages, in four of which he is a tree person. Yes, you read that right. I’m not even going to provide any context, since he honestly plays such a small, next-to-infinitesimal role in the actual events of the book itself, but what you get is what you get. 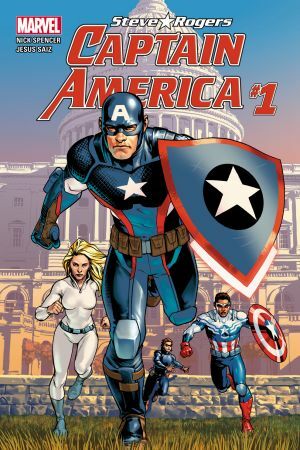 Captain America: Sam Wilson [2015-Present]: Under Nick Spencer’s direction this book has garnered a lot of attention, most of it positive, largely due to the men and women of Fox & Friends lambasting it for being “too political”. While the writer’s approach to what a man wearing his nation’s colours to battle evil is a refreshing one, at the time of this writing we’re only five issues deep, and for three of them Sam has been a wolfman. A clear throwback to Captain America #402, where the same happened to Steve Rogers, these issues have also featured a lot of our hero being rescued by fellow crimefighter Misty Knight, pictured on the cover on the left. Sam also continues to appear in All New, All-Different Avengers  as Captain America, but with only three issues published so far there’s not enough out for me to comment on, ill or otherwise. With all of that being said, having prominently featured in four books and starring in two, Sam Wilson as Captain America has been evil, an actual ent, and a werewolf, respectively. With the latter two in particular a conversation about the Black body is raised [discussed in-depth about the superhero Cyborg here]. Race has been a long and troubled road in America, and due primarily to slavery Black bodies have often been viewed as being less than human at worst, and as property at best. These two examples of Sam Wilson having been transformed draw a particular parallel to Disney’s The Princess and the Frog in which Tiana, the film’s titular heroine, spends the vast majority of the film as an amphibian. In what contexts is our hero present, and at such a time that they are, when are they simply allowed to be Black? Even more than that, when are they allowed to just be a hero? With Sam Wilson’s publication history as Captain America having been wrapped up, the question is where it leaves us, or why it matters at all. Has his character truly been maligned, and is Marvel Comics actually guilty of abject racism? Aren’t all of these issues [no pun intended] par for the course as far as superhero comics, a medium that lists the bizarre as one of its primary characteristics, is concerned? 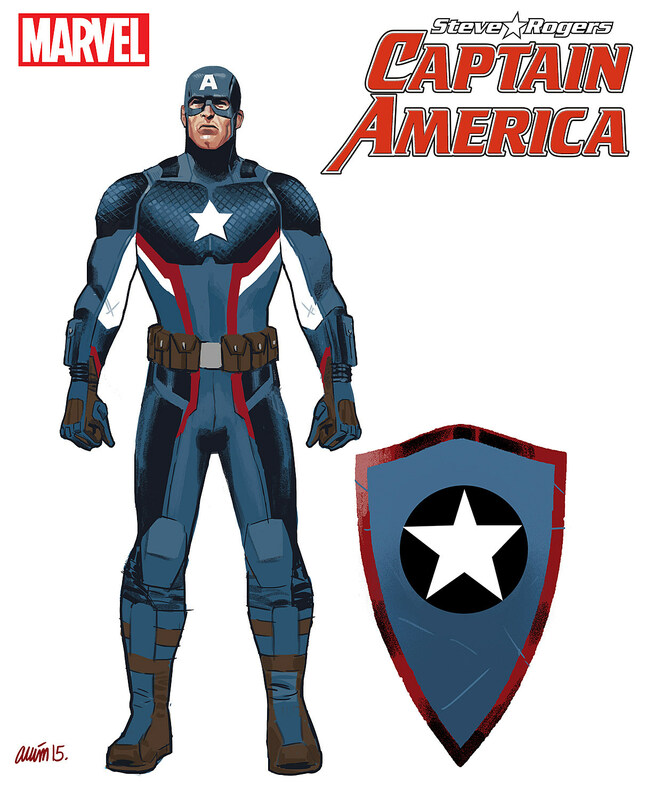 The “Real” Captain America Returns, Now What? While Wheeler simply notes that this doesn’t really help the assertion that Sam Wilson is “The” Captain America, I want to add that it’s particularly troubling when taking into account that all six issues of All-New Captain America had him facing off against that very threat. Are we now supposed to believe that his doing so wasn’t a challenge to the nefarious organization? Why is this solely a problem that Steve can tackle, but not Sam? -simply using the original piece of armour likely won’t be enough for Sam Wilson to win out over his predecessor and longtime partner. Not with a publication history like he’s had up to this point. While sales for all comics are expected to flag with each consecutive issue, this kind of direct competition feels like a nail in the coffin. With a blockbuster film on the horizon and his 75th anniversary on the horizon it makes sense that Steve Rogers receive the spotlight, and rightfully so. That said my fear, and it remains to be seen if it pans out or not, is that much of the attention he receives will result in an equal amount taken away from Sam Wilson. It’s not that I don’t think the Marvel universe is too small for two Captain Americas, it’s that at this point one’s too big ignore, with the other just small enough to be forgotten. This entry was posted in comics, race, writing and tagged Al Ewing, All-New Captain America, announcement, Captain America, Captain America and the Mighty Avengers, Captain America: Sam Wilson, Captain America: Steve Rogers, Capwolf, comic books, comics, Hawkeye, Kate Bishop, legacy characters, Marvel, Miles Morales, Nick Spencer, race, racism, replacements, Rick Remender, Sam Wilson, Spider-Man, Steve Rogers, The Falcon, Titus Andromedon, tree man, Uncanny Avengers, werewolf, wolfman. Bookmark the permalink. First, thanks for linking to the guest post on my blog (re: Cyborg). Secondly, let me echo your disappointment. Not too long ago I wrote about Sam Wilson: Captain America in a post entitled, “The Captain White America Needs” in which I lauded the possibilities of Spenser’s book, but criticized the direction I could already see the book going in. When I wrote it I had no way of knowing that the whole Cap-Wolf thing was on the horizon and would last more than one issue (it is a flash in the pan gag, and there is nothing in the plot that forces him to remain in that form). I think you’re right that he is not being given much of a chance to be Cap, or even work towards being a very successful hero on his own terms. The return of Steve Rogers as to share the role of Cap just waters down the effect of choosing an African-American to do that job. . . but I can’t say I’m surprised, just disappointed. Oh, hey, you’re comment on The Hooded Utilitarian a lot, right? As I was writing this I remembered that article you wrote about Cyborg and figured it fit in perfectly about what I was trying to cover re: Sam Wilson. Hindsight is 20/20, because what I would really love to do now is write about the characters who are Black, technically speaking, but never are never really represented as such. This is much more egregious in film, where Adewale Akinnuoye-Agbaje, in two separate films, has been a bull monster and a crocodile monster respectively. Cool. But one detail: I did not write the Cyborg post, Robert Jones, Jr (aka Son of Baldwin) wrote it as a guest post on The Middle Spaces. I did write 95% of everything else on that site. Oh and yeah, I have written a bunch of stuff for HU and comment there when I get the chance. Oh man, that’s totally my bad. That said, I have a whole bunch of your articles loaded up to check out this afternoon. Really looking forward to the one on Doctor Voodoo in particular.